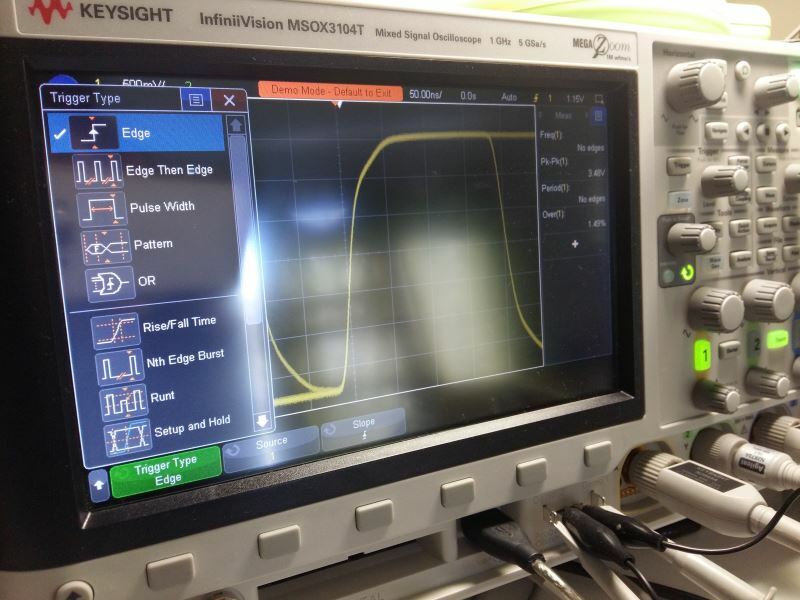 I would like send an ocean of thanks to the oscilloscope maketing team at Keysight Technologies for sponsoring us with a highly capable instrument! were it not for your generous contribution we would still be roaming in the dark unable to make decisive measurements, your contribution has already helped us open many measurement insights and helped us solve tough problems. 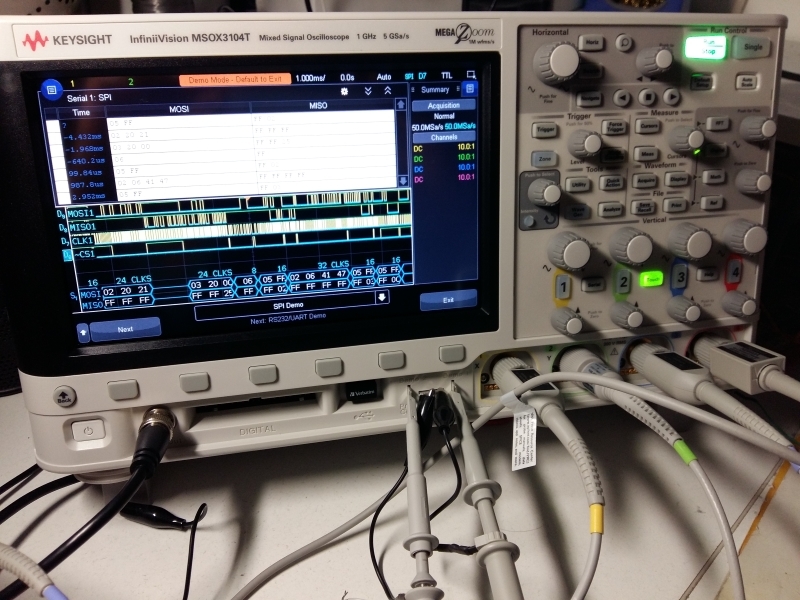 This review is a short summary of my experience using Keysights InfiniiVision MSOX3104T X-Series Oscilloscope, it is by no means a fully comprehensive review this amazing instrument has to offer, (and how can it be?) one article cannot do it justice!, with that said I will keep updating the site with projects that will illustrate and feature the capabilities with up and coming projects so stay tuned. We a small start-up mainly involved with IOT (Internet of Things Research and Development) and rely on measurment instruments to build prototypes, with the humble oscilloscope being the most important of them all, and as the old saying goes, “use the right tool for the job!”, with that said, the number of tools required to perform measurements during the various stages of measument is very demanding from an (Accuracy, Time and Cost) point of view. The InfiniiVision MSOX3104T X-Series Oscilloscope (100Mhz to 1GHz) is a mid-range (top of line) digital oscilloscope from the MSOX3000T family line, it’s a highly-sophisticated, highly capable 6-in-1 instrument with an arsenal of features and capabilities defined as a “Swiss army knife” oscilloscope! The main selling points are as follows. The InfiniiVision MSOX3104T is designed as 6-in-1 instrument, before I list the instruments I have to make it clear that some instruments are optional extras, some people might not make use of all 6 instruments, so upgrading as your measurement investment grows is up to you. 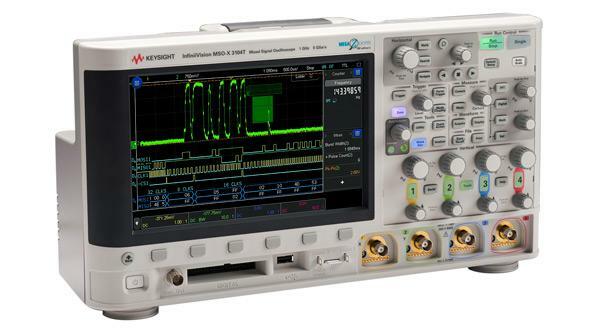 Out the box you get 3-in-1 as a standard (with the trial mode running you get them all unlocked for 30-days) also note, the 30-day trial may be extended so chat to your Keysight dealer near you. Here is a summary of the 6 instruments, I won’t go into detail how each of them work, as I felt each deserves a separate dedicated write up, what I will say is quickly running quickly through each them had me very impressed (specially the built-in WaveGen), so stay tuned in the future. 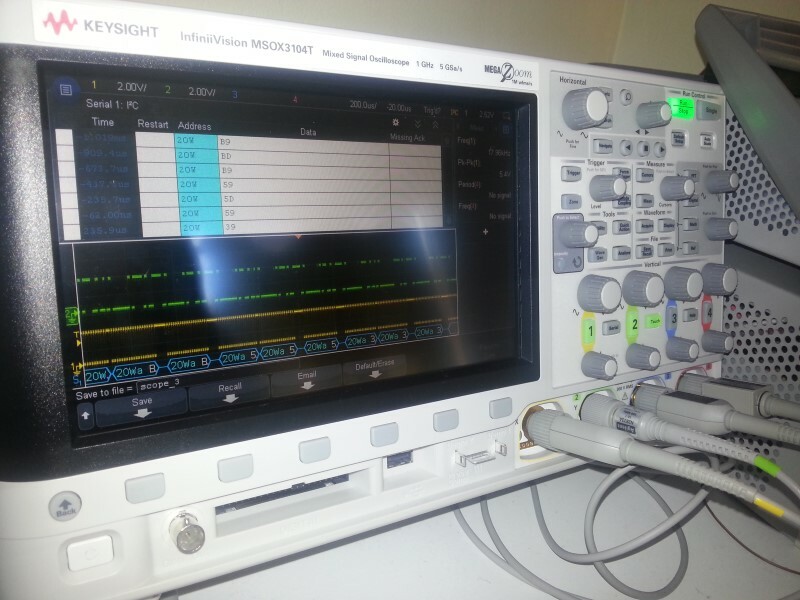 Keysight InfiniiVision oscilloscopes, including the new 3000T X-Series, use hardware- based serial protocol decoding. Some other vendors use software post-processing techniques to decode serial packets⁄ frames, and therefore have slow waveform and decode capture rates and could miss critical events and errors due to a long dead-time. Faster decoding with hardware-based technology enhances the probability of capturing infrequent serial communication errors. After capturing serial bus communication, you can easily perform a search operation based on specific criteria and then quickly navigate to bytes/frames of serial data that satisfy that search criteria. The 3000T X-Series can decode two serial buses simultaneously using hardware based decoding, and display the captured data in a time interleaved “lister” display. The layout of packets is nicely presented in a Tabular + Slip Lane style view or a Full Tabular with decoded export options. The only limitation of the scope is memory depth at 4Mpts its unable to capture lengthy data capture. Overall I was very impressed with this feature and will be using it aggressively in the future. The design and construction of the instrument is really good! the first thing I noticed was left extended black bezel, seems like it functions as an absorber to stop reflective components and adds the impression the display is larger than 8.5inchs. The rear of the scope contains a key lock which is really useful to curb theft especially in a lab/student environment, the top of the instrument contains a built-in probe carry case for up to x4 probes. The feel of the rotary encoder knobs is nice and solid with no “play” on the encoder like cheaper scopes, furthermore the knobs are sleeved with rubber, this gives a nice grip during operation. The buttons are standard soft key with the caption printed clearly. The operation functions are nicely grouped and user friendly, with the analogue channel buttons illuminated when activated. Debugging signal issues is a time-consuming costly process! (i.e. 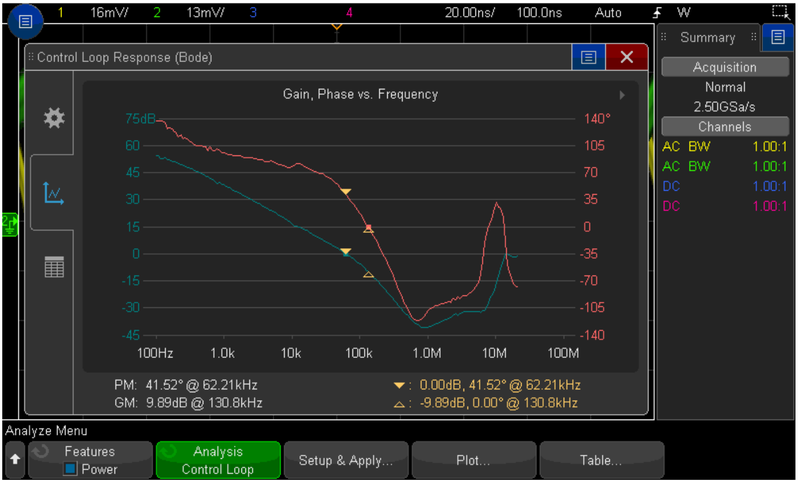 finding a rare signal glitch) this is where oscilloscope update rate matters, and it matters a lot! The InfiniiVision 3000T X-Series oscilloscopes offers a waveform update rate of Wfm > 1,000,000 waveforms per second. For demonstrating purposes (and I could have used the built-in demo test signal to do this) I instinctively unpacked a work in progress self-oscillating class-d audio amplifier I started back in 2013 and started probing around critical signal paths around the power FET. During audio playback, I was able to instantly record rare switching events at the MOSFET gate that wasn’t present when I used other oscilloscopes in the past! Triggering is one of the most fundamental functions used on any oscilloscope, its purpose is to perform characterization on the intended signal, the basic triggers found on most digital oscilloscopes are Edge Trigger (which is the trigger on a rising, falling, alternating or either edge of any source) and Pulse Width Trigger (trigger on a pulse on a selected channel, whose time duration is less than a value, greater than a value, or inside a time range) both Edge and Pulse Width triggers are found on all digital oscilloscopes. It’s true that, if you’re a beginner the above mentioned are suffice, however, as you move into advance measurement scenarios that requires reliable minimal trigger setup configuration used to debug complex signals, triggers such as Edge and Pulse width won’t cut it! The Keysight InfiniiVision 3000T X-Series offers an arsenal of triggers! The list is so large each deserves an entire descriptive article for each one notably the Zone Trigger System! Below is a summary list. 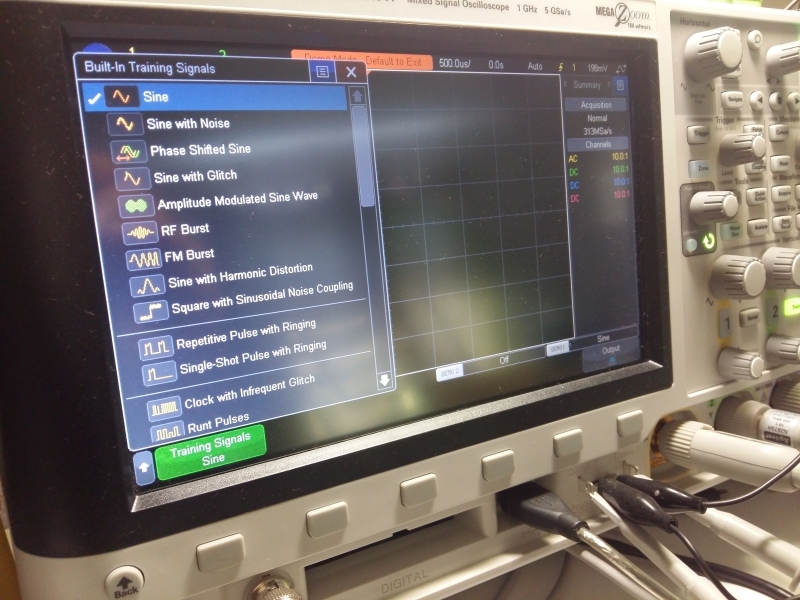 The InfiniiVision 3000T X-Series offers the a (DSOXEDK Education and training kit) with this feature the oscilloscope uses the built-in function generator to an array of built-in training signals, so that electrical engineering and physics students can learn what an oscilloscope does and how they can perform basic oscilloscope measurements. Also, included in the kit is a comprehensive oscilloscope lab guide and tutorial written specifically for the undergraduate student. Professors and students can download this at no charge. The 3000T X-Series offers a hardware accelerated pass/fail test, what this feature does is overlays an incoming signal and with a reference mask overlay and performs integrity arresting tests based on timing information, waveform shape (eye diagram). Tests are executed 270,000 times per second allowing the user to select multiple test criteria. 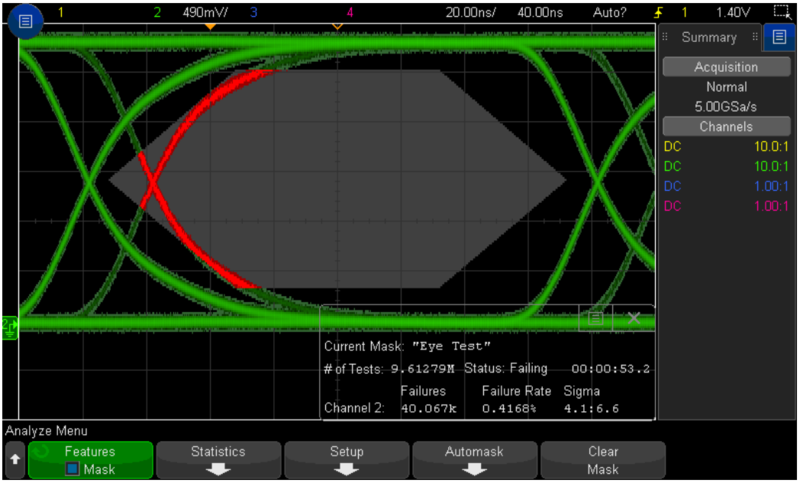 Keysight has lot of free reference mask I will be using this feature more in the for measuring hardware timings for DD3 transmission lines, CAN bus signal integrity test and much more things not obvious to me at this time. Every engineer, enthusiast and hobbyist has worked with a power supply, it’s the most fundamental electronic circuit block and it’s critical to understand how to troubleshoot and analyse it. Sadly, for most, it’s very expensive to obtain induvial measurement tools to analyse them correctly, notably, switch mode power supplies.The DSOX3PWR option on the 3000T provides a suite of power measurements and analysis all in on package. Here is a breakdown list of all the analysis options.